your home. Flower arranging has never been this easy-or this much fun!A sunny, fresh bouquet of daffodils enchants with the promise of spring. A sprig of tiny blush pink roses tucked into a silver bud vase makes a quiet statement of love and romance. Throughout the year, nothing speaks to the beauty of life's everyday joys and special occasions like flowers. 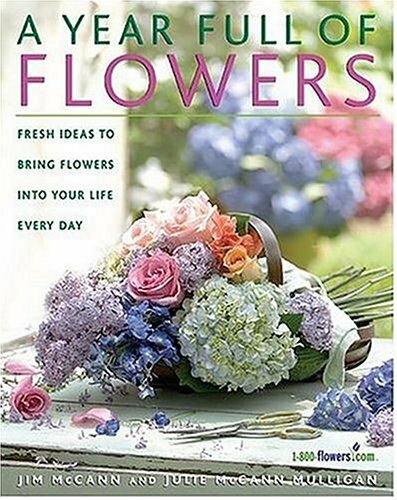 With the inspiration of this gorgeous full-color book from the nation's leading source of fresh-cut and seasonal flowers, anyone can learn how to have fun with flowers in novel and delightful ways. Here you will find: - Flower arranging basics-equipment you need to get started; tips on cleaning, cutting, and conditioning stems; guidance on design principles of color and texture, balance and proportion- A glorious celebration of the seasons-with such choices as dogwood, tulips, and lilacs in spring; zinnias, sweet peas, and peonies in summer; sunflowers, chrysanthemums, and decorative gourds in autumn; poinsettias, holly, evergreen boughs, and pine cones in winter - Dozens of original presentations, both elegant and whimsical-from a fresh vegetable vase made of beautiful green asparagus to a stylish place setting and napkin ring of lemon leaves and fragrant seeded eucalyptusWith step-by-step instructions and sidebars sprinkled throughout providing insider secrets, shortcuts, creative solutions to commonly asked questions, and some advanced techniques, A Year Full of Flowers will turn any flower lover into an inventive flower arranger.